Acne scar blemishes, freckles, age spots and other skin discolorations can easily be remedied with RevitaBright Skin Brightening Gel. This topical skin whitening gel can help brighten dark underarms as well as discolorations in intimate areas, in addition to melasma spots and birthmarks. RevitaBright's gentle, nonirritating formula is safe to use in even the most intimate of areas and does not contain any harsh chemicals, dyes, or fragrances. Balance your uneven skin tone now with RevitaBright. Before using RevitaBright, test a small area on your arm to determine sensitivity. To use, cover skin thoroughly as needed and massage with fingertips until dry. For optimum results, use RevitaBright consistently in the mornings and evenings. Arbutin is a derivative of hydroquinone that occurs naturally in the bearberry plant, as well as in the skin of the pear fruit. Arbutin blocks tyrosinase which is the enzyme responsible for kick-starting melanin production. As such, arbutin is a highly-effective natural skin brightening agent. Kojic acid provides similar skin brightening benefits as hydroquinone, but is safer to use on sensitive skin-types. Kojic acid is naturally derived from certain species of fungus, and is also a by-product of fermented rice wine. Clinical studies have linked kojic acid as a beneficial remedy for melasma due to its ability to hinder melanin production in the skin. Excess melanin is the primary cause of age spots, freckles, and other unsightly skin discolorations. Alpha hydroxy acids such as lactic acid are known for their restorative benefits to photodamaged skin (skin damaged by excess sun exposure). Like other AHAs, lactic acid has been shown to increase collagen production, as well as increase the thickness of the skin. This is why milk, which contains lactic acid, is a common ingredient in at-home beauty masks and facial scrubs, not to mention dermatological chemical peels. RevitaBright also contains carrot extracts, Indian gooseberry extract, green tea leaf extracts, beta-glucans, grape seed extract, strawberry saxifrage extract, mulberry root extract, skullcap root extract, carrageenan powder, pyruvic acid, lactic acid and malic acid. 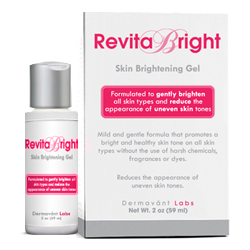 A fair and flawless complexion is within reach with RevitaBright Skin Brightening Gel. Order yours today!